Produce a lecture based on the above chapters of the "Natural Calculator", to encourage people to use them as the practise material creating people that have mentally mastered the basics of simple multiplication. Produce chapters 6 (remaining part of), 7,8 and 9 of the "Natural Calculator" book. Develop the material available into a single modular course. Hopefully being consistent with the syllabus's of various examining boards. 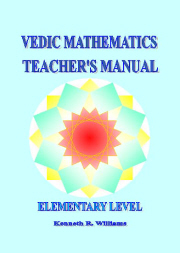 Develop new methods and applications of Vedic Mathematics. Allow the tutorials to store the students attempts at answering questions in the tutorials, so the student can use this information to monitor how they are progressing. Develop pages to help the Vedic Mathematics Community communicate and grow e.g. social media type functionality. Create proper language translations of the Vedic Mathematics material, rather than the approximate google translation option provided at present.